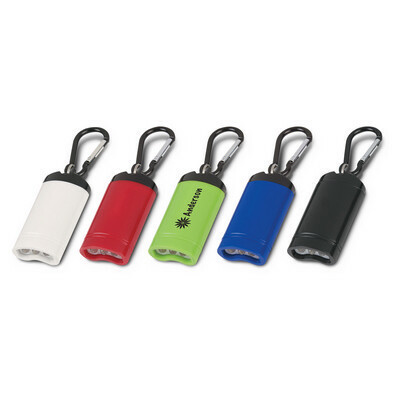 Quick release flashlight with three powerful LEDs and a carabiner. Has a strong magnet in the cap so the flashlight can be clipped in place and then removed and attached as required. A production lead time of 10-15 working days applies to this product. Colours: White, Red, Lime Green, Blue, Black. Dimension: W 32mm x H 63mm. Print Description: 19mm x 32mm (two colour max). Print Type: Pad Print. Packing: Loose packed. Less than minimum quantities are not available for this item. MOQ applies per colour on this item.. Price includes : Printing 1 Colour. Setup is included.